Enjoy each camping trip with this cute T@B 400 teardrop camping trailer in tow. This model features all of the necessities that make camping enjoyable. Step inside and find a Lagun style dinette area up front with a large picture window for a great view of your surroundings. You will certainly enjoy your meals here, and it can also double as an extra sleeping space for one more camper at night with the table folded down. The kitchen area is to the left of the entry door and features a round sink, some counter space, and a two burner cook-top. There is also a refrigerator for your perishables, and storage cabinets for your things. The opposite side features a convenient wet bath including a toilet, shower, and fold down sink. There is a handy wardrobe just outside the bathroom door for all of your clothing needs. The rear of this T@B 400 features a queen size bed with shelf at the head of the bed, and a 24" TV for your viewing pleasure along the wall. You will love the stargazer window overhead that allows you to enjoy a night sky view while you lay comfortably in bed. There is also additional storage beneath the bed, plus so much more! A teardrop trailer is a compact and aerodynamic trailer that is easy on the gas tank as well as on the eyes. These nuCamp T@B and T@G teardrop trailers are smaller and more maneuverable for adventure seekers that want the benefit of a dry place to sleep, and some camp comforts without having to haul a larger camper, or buy a special vehicle with which to tow it. The T@G can easily be pulled behind any small SUV or car. 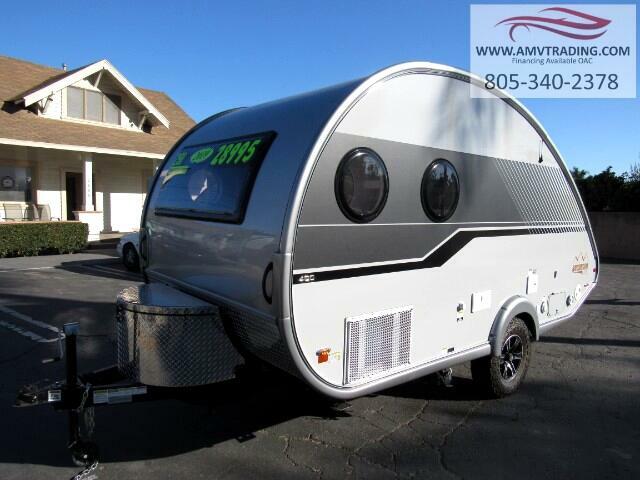 If you are interested in learning more about the T@G andT@B teardrop trailers or the Liberty Outdoor Max and Mini Max for sale in Southern Californiayou can call 805-340-2378 or email amvtrading@ymail.com or come in for more information Or, if you want to see our teardrop trailers for sale, you can visit us to our dealership to check them out up close and personal. See our current inventory below for more details. We can't wait to help get you into the RV of your dreams today! Message: Thought you might be interested in this 2019 nuCamp RV’ Tab 400.